I very much believe that there are no 'right' or 'wrong' ways to do anything when making garments. There are indeed a whole load of techniques, methods and approaches you can learn, but it's personal preferences and inclinations that determine when and how any of them should be implemented. This is partly why sewing is such a creative activity. And sewing's openness to interpretation and free-wheeling is even more pronounced when it comes to refashioning or remaking existing garments, when maybe your text book's technique suggestion might not apply. Because there are no 'correct' or 'incorrect' approaches, I am no more qualified than the next sewer to make a judgement on how to refashion unwanted garments. 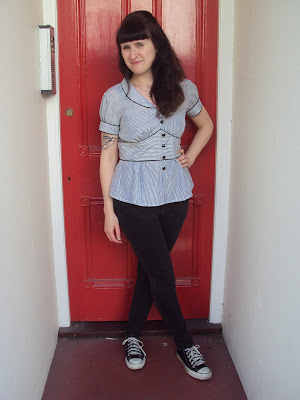 However, I have spent an unusually large amount of time thinking about and 'practising' the art of refashioning over the last couple of years during which I have accrued lots of tips, tricks and techniques that might come in handy to those who are a little newer to it. Equally, I'm sure there are loads of things I can learn from other sewers, and that's why sewing blogs are so frikkin' awesome! 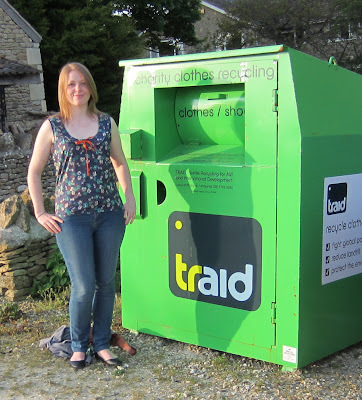 All my 'Refashion Friday' posts will be about reusing unwanted garments that are very common and easy for most people to get hold of. It shouldn't be too much of a challenge to source any of the basic garments from a charity shop/thrift store/op shop, if not from cupboards in your own home! Today I want to talk about one of the most common garments on the planet: jeans. With something as ubiquitous as jeans, surely we can come up with some awesome things to do with some of the unwanted ones? Of course we can! But first up, with jeans being in such ready supply, what should we look for when picking some to start a refashioning project? What do you plan to make? This is going to have a big impact on what pair of jeans you choose. 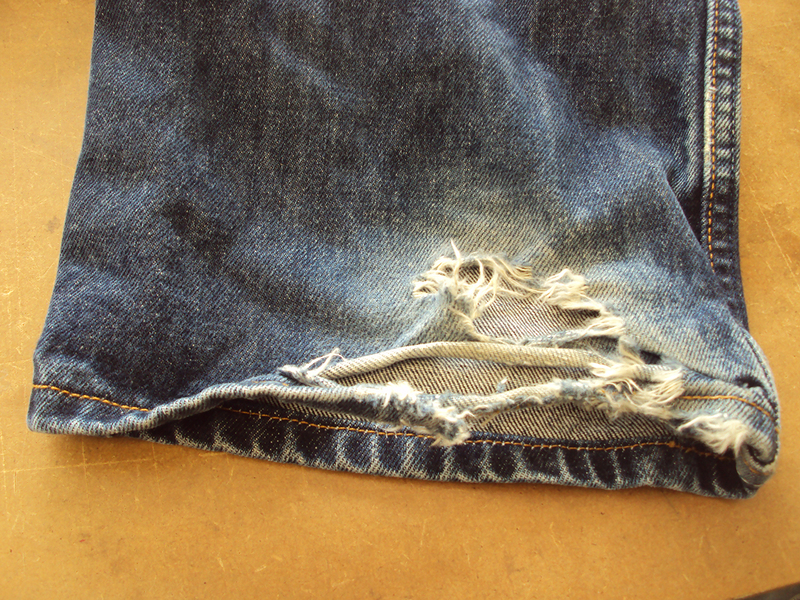 Broadly speaking, most projects I've seen that started out as a pair of jeans fall into one of two camps. 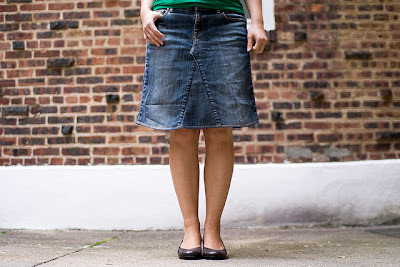 The first are projects that still very much retain a jeans-like appearance like cut-off shorts, skirts made from unpicking the inside leg-seams and stitching them down in a different position (example pictured above), simple shoulder bags made from the top of jeans, and so on. For these types of projects, you need only concentrate on the appearance of the top section of the garment and the sizing. The second type of jeans-based projects use the original garment as a source of denim fabric. This camp of projects are my personal favourite because there are less restrictions in terms of imagination, but they can also require a bit more thought when selecting the initial garment/s. Size of the jeans. As with all refashioning and remaking of existing garments, the bigger the garment, the more fabric you have to play with. That is why, unless you are planning on making something from the first camp of projects that require a certain waist measurement, you may be best to entirely disregard women's jeans when shopping in the charity shop. The larger sizes of men's garments, when cut apart or unpicked, can provide you with a huge amount of fabric. When trying to get the most fabric from the jeans, you'll find widest part will be what I charmingly call the 'under-bum area'. From the side seam to the inside leg, underneath the back pocket, is a wealth of denim. So, as grim as this sounds, this area might be your first port of call when assessing the condition of your prospective pair of jeans. Any fading, thinnest from wear or even holes (see picture above) will restrict the amount of harvestable denim from that section. 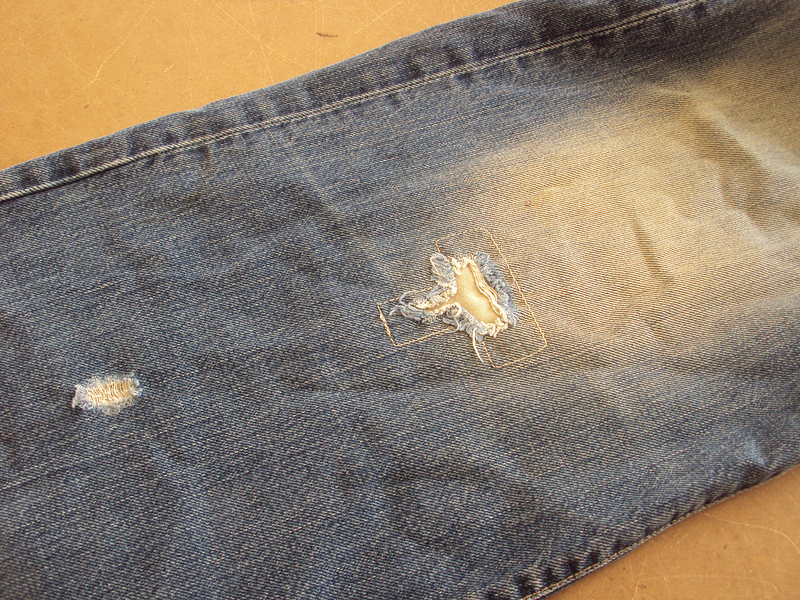 Similarly, you need to watch for other areas that are easily damaged through wear. To state the obvious, thinning, fading and holes appear most frequently at the knees and back heel area (see picture above). Both will effect how useful the legs of the jeans are to you, especially the knee-area. Fading is one thing: you might actually want to incorporate some cool knee-fading or 'designer' fading and worn effects into your project somehow. 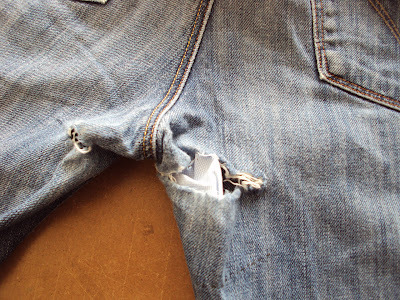 But be careful that the knee area hasn't worn too thin or even become permanently misshapen (see picture below) through the original owner's wear and tear. Side seams. Unless you are planning on only harvesting long strips of denim, you'll probably want to cut up along one of the side seams to lie the denim flat to get maximum use from the legs. 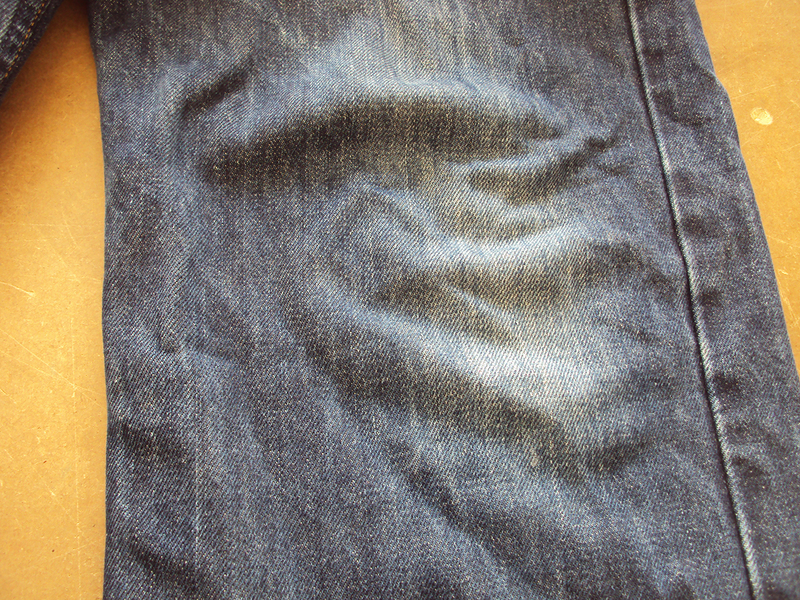 You can lie the centre front of a pattern piece along the side seam and get a fairly decent sized piece out of some jeans. 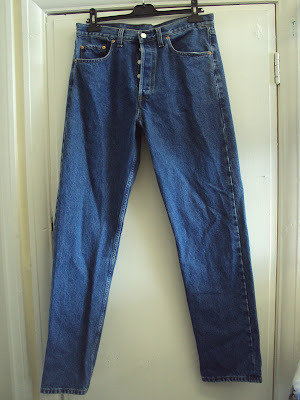 If that is something you might want to do, a straight legged style of jeans (se picture below) might be important rather than a flared or boot cut style that will have curved leg seams and restrict your options. Also, if you want to retain one of the leg seams in your project, before you get too scissor-happy, decide if it's the lapped seam with its twin rows of top stitching or the standard seam with no visible stitching you want to be at the centre of your pattern piece, as most pairs of jeans have both forming each leg. Another point to consider if you choose to select men's jeans for your project is that dude's jeans are not made with any quantity of stretch (elastane or lycra). Unless you are dealing with some hipster skinny jean styles of course, (and if you are, good luck harvesting any denim from them!). Once again, it barely needs stating, but consider what type of thickness or properties of denim will work best for your project when choosing jeans to work with. Strong, thick denim (like the jeans in the picture above) can be ace for certain things (bags, facings etc), just as lighter or stretchier denim is better for other things. If you require some stretch for your project (maybe you are creating a bustier, for example), I'd advise trying to find a large size of women's jeans for your purposes. My final point is colour. Most likely, whatever you make from jeans will be formed from panels (ideas to come in future instalments of 'Refashion Friday') and it is also very likely that your project may require more than one pair of jeans. When faced with multiple pairs of jeans, its amazing how much variety within 'blue' or 'black' there can be. It can be a bit of headache if you want to match colours exactly to create a very cohesive look to your final project. When I want to create something with a single tone and shade, I often use jeans from the same brand (usually Levi's or sometimes Wrangler) as you have more control over the uniformity of colour. 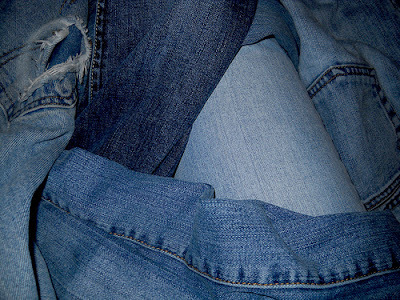 Please remember that lots of fun and interesting effects can be created by combining slightly or very different tones and shades of denim jeans in the same project (see picture above). Now I fear I've either put you off trying to work with jeans because I've laid down heaps of things to consider, or you think I'm slightly mental for spending quite so much time thinking about other people's unwanted jeans! Here are a few garments I made back in April that I've been dying to share with you, but had to keep mum (nice pun, eh?) for a while. When the super-lovely and generous Emily of the Botterman Empire offered to help me realise my dream to make a pair of shoes, we discussed how I could in turn make her something by way of thanks for giving up her Saturday to spend it at her workplace. At first she mentioned her love of my denim sailor trousers which I would have happily reproduced for her, but then she confided that she was 'a little bit' pregnant! Too soon to officially announce, which is why I kept these creations under my hat until Emily had had a couple of scans and the all-clear. I wracked my brains and consulted two recently pregnant friends in an attempt to figure out how to materni-fy the sailor trouser pattern, but with time and expertise constrictions (not to mention I'd never met her in the flesh at that point so couldn't envision her body shape), we agreed that I would create some comfy maternity tops made from jersey instead. 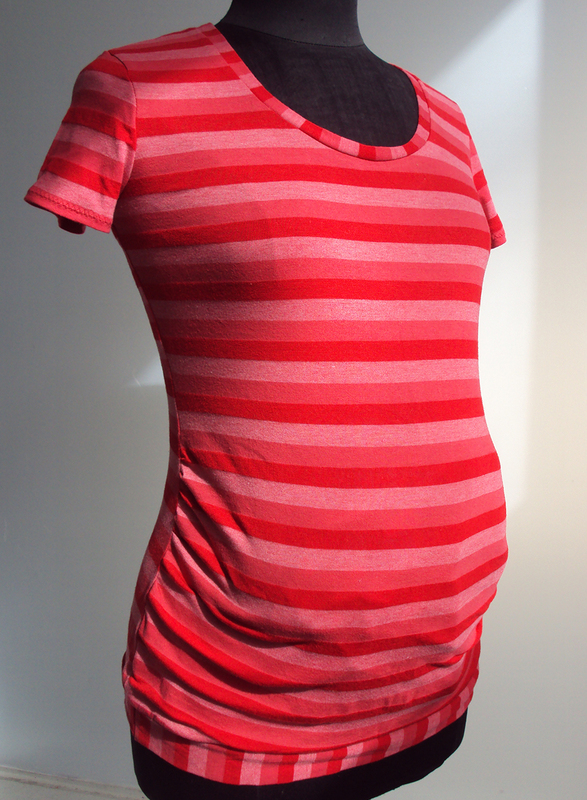 Using some advise from my then-pregnant boss who had made a few maternity garments for herself, I altered a semi-fitted T-shirt pattern to accommodate a bump. 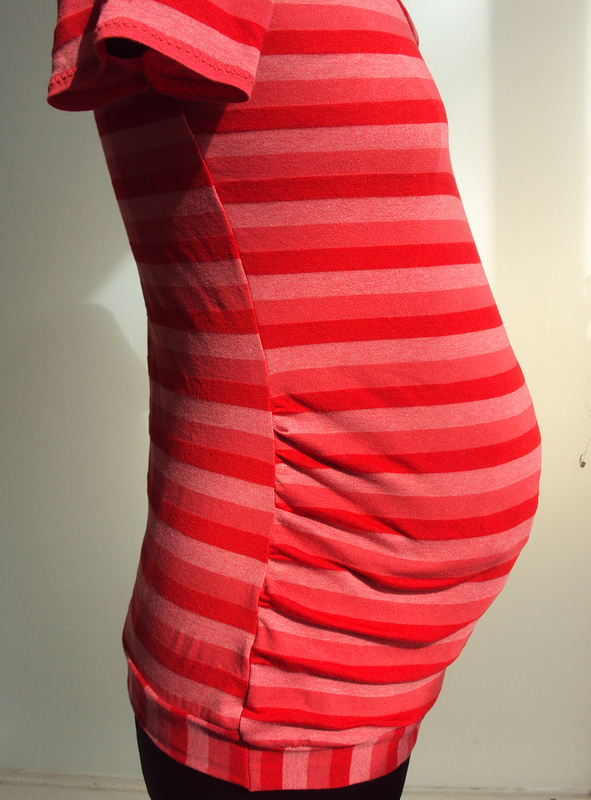 Forgive the poor approximation of a belly bump in these photos! I had to pad up the tailor's dummy with some folded fabric giving a rather lumpy effect, but it gives you the general idea. 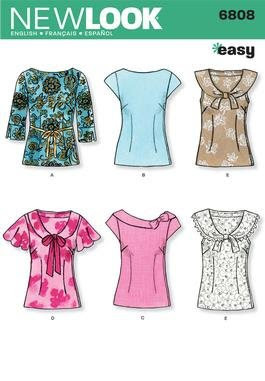 I gave Emily a rough run-down of the types of jersey I had in my stash or had access to at that time and she gave me her preferences on fabric and style options (sleeve lengths, necklines etc) and I was away. The first top I made (pictured at the top of this post) used some super-soft tonal red fabric that I procured at the Brighton De-Stash Meet-up back in February. I think it initially belonged to Rehanon. 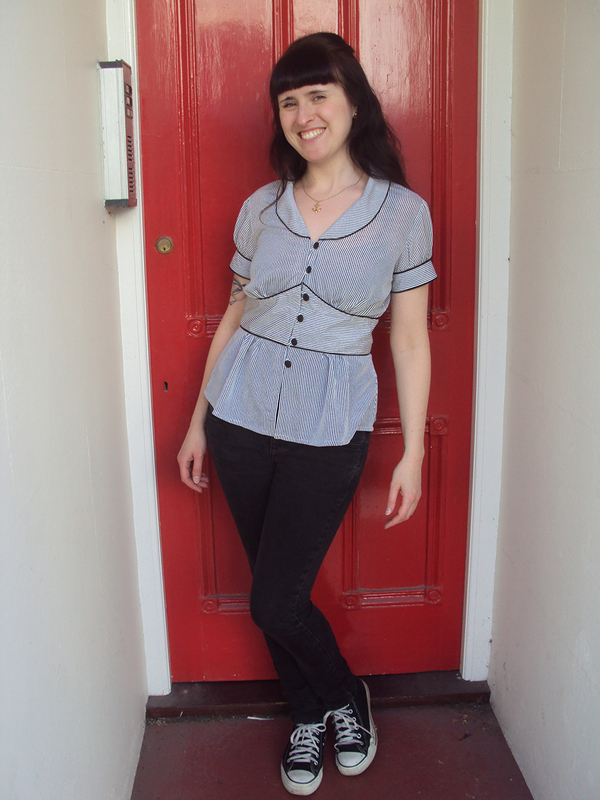 I made a short-sleeved scoop neck style using the alternate stripe direction for the neckline binding and the waistband. The second version was a good old basic black option with 3/4 sleeves and a scoop neck. 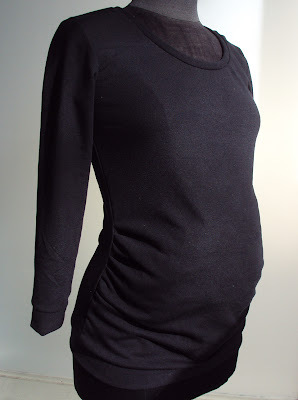 I wanted to provide her with a garment that would be super-versatile to wear on its own or under a cardigan, seeing as her baby is due in November when it's often super-chilly. 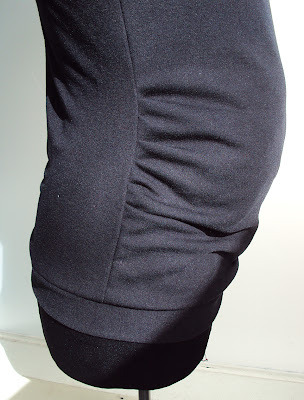 Unfortunately, the black knit I used was quite thick and didn't have very much stretch content, the result was that it was too tight and restrictive for Emily to wear. A couple of months later I made her a new black version from stretchier, lighter black jersey fabric which I believe performs much better. The last version, you may not be surprised to learn, is my personal favourite. Emily gave me the green light to create the ultimate in nautical maternity wear! If I ever get pregnant, you know this is the type of garment I'll be wearing. Style-wise, it has 3/4 sleeves with contrasting direction cuff bands and a slash neckline. 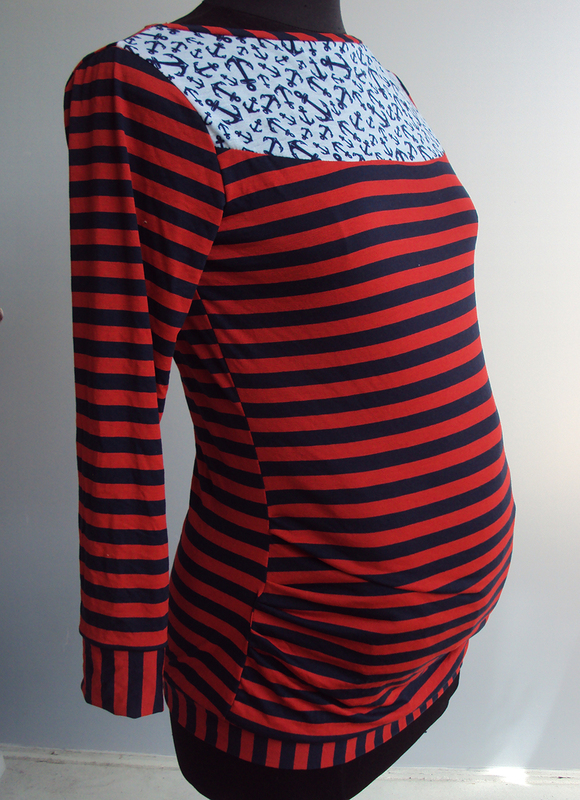 The red and navy striped jersey is super slinky with a high elastane content so it should be really comfortable and pleasant to wear. 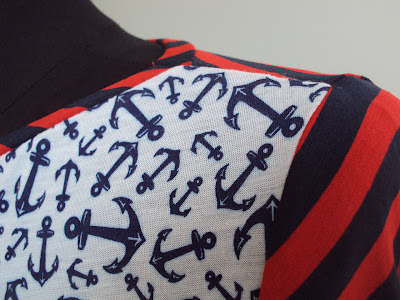 The upper yoke panel uses a piece of anchor print jersey that appeared in a delivery at work. I considered adding gold buttons somewhere too, but chose to err on the side of caution just this once! If anyone is interested, I'll be happy to produce a tutorial on how to pattern cut your own maternity-bump friendly jersey tops. If that is something you'd like to see on this blog in the future, leave a comment on this post and if the idea has sufficient appeal, I'll get on it over the next few weeks. 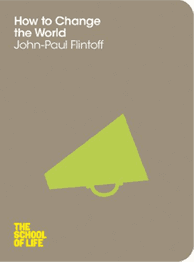 If you read my review of his previous title, 'Sew Your Own', you'll know that I find author and journalist John-Paul Flintoff something of an inspiration. I felt he had lots to bring to our lovely sewing-blogging community through his thought-provoking discussions into the wider motivations and implications behinds the clothes-making activities that we so enjoy. 'Sew Your Own', for me, opened lots of avenues of thought, and raised some questions I was desperate to put to Mr Flintoff, so I was utterly thrilled when he agreed to spend some of his valuable time answering them for a small interview that I posted here. Then a couple of months ago I received an email from him sent to potentially interested parties announcing that his latest book, 'How to Change the World', had been published. I was definitely an interested party. In the interest of full openness and honesty, I received a copy of this book for free. This is because I was cheeky enough to ask for one, not because he or his publishing company were attempting to solicit favourable reviews. However, a favourable review is what I must give it because that is what it deserves. The simplest way to describe this publication is as a 21st Century self-help book, but the associations that may conjure do it a disservice. This book lays a path to help anyone with a drive to affect any change beyond their own internal world find their voice and harness their effectiveness to start to do what they feel could or should be done. Unlike a traditional self-help tome, 'How to Change the World' is small, succinct and measured, and this form makes his arguments all the stronger. With a potential mini-epihany on almost every page, he gives the reader the space and respect to apply his points to their own hopes and plans, without lacing each point with lashings of unnecessary or distracting examples or personal tangents. Which is not to say you feel detached from the author: Flintoff's deep desire for the reader to fulfil their own world-changing potential is what keeps this book warm and driven. Oh, and it's a great size book to buy if you're a commuter! 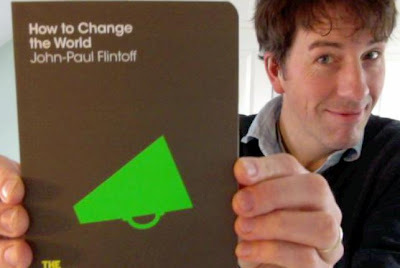 This little book has helped me see that my personal interest in and endeavours towards changing the world are very much valid, and in fact are already more defined and engaged than I had really realised. At times I feel guilty for focussing so much of my efforts on just trying to change my own and other people's habits of consuming clothing rather than spreading my efforts out over a broader range of environmental and social issues. But in fact Flintoff proves we are at our most effective when we fight for the causes that most inspire and impassion us. I'll definitely revisit this book again when my personal interests, views and missions inevitably shift or refocus. After I've lent my copy of this book to everyone I know, of course! So each Sunday I'm going to share a photo of my favourite me-made outfit of the previous week, like I did last Sunday whilst announcing the new Me-Made-Living flickr group. The reason I want to do this is kind of two-fold. I want to remind people that me-mades are for life, not just Me-Made-May! Plus I want to keep pushing myself to try new combinations of self-stitched items to get the most from my creations and not to just always rely on the same tried and tested combinations. I figured lots of new combinations from the last Me-Made-May '12 challenge as well as how to bring in some of my newer and previously unused creations, I don't want to go back to resting my on laurels. I will also briefly reflect on what worked, so hopefully I will actually learn to put outfits together more successfully for my everyday life. This outfit, although not particularly innovative or revelatory, was a success because I wore it all day to work, then to head home quickly to stuff my face with dinner, then stomp across town to a swing dance class, then for a cheeky post-class half of cider, and them back home again. I was pretty exhausted by the end of the day but at no point do I think I felt uncomfortable in my clothing. 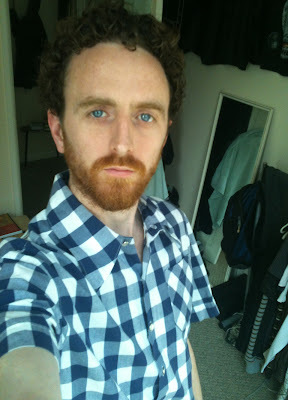 If you missed last Friday's post, I must explain that I am embarking on a new weekly feature entitled 'Refashion Friday'. Can you guess which on day this feature will run each week?! It's aim is to provide inspiration, ideas, tips and tricks to sewers interesting in using existing garments to make something new. Massive thanks to the lovely peops who left such nice comments on last week's post. I thought the appeal of this new feature might be a bit of a slow burner for most, but I'm thrilled that already some are excited about forthcoming installments. Today's inspiration point is a blouse made from a mens chambray/denim shirt and some white embroidery anglaise fabric. The whole garment is based on a fairly standard commercial blouse sewing pattern (see below). The centre front of the pattern was lined up to the centre of the button stands when cutting out so the existing button stand, buttons and buttonholes would be retained in the final garment. The bust darts were stitched but the waist darts were omitted to make a looser more casual fitting garment. 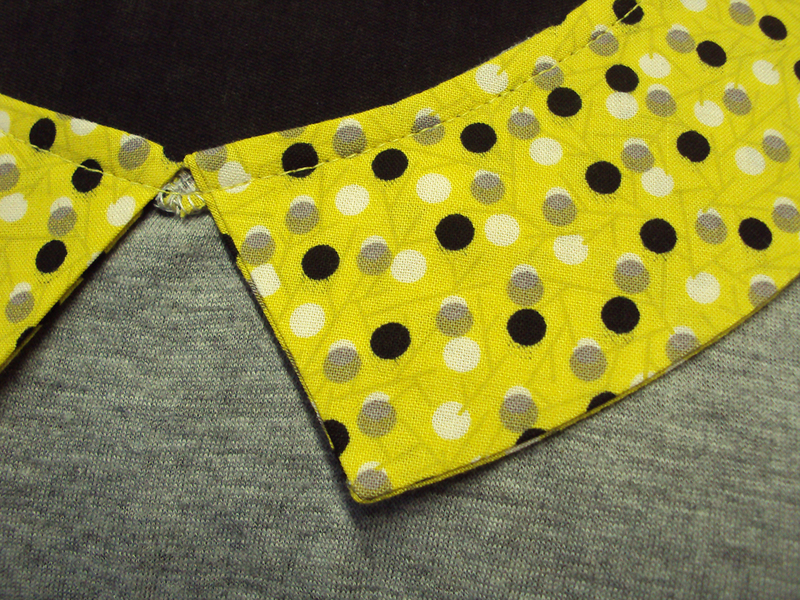 I retained the original shirt pocket and used the original hem in the final design. Using the existing hem means that the pocket gets pushed up higher than on the original garment. Personally I like that because it's a cheeky reference to the origin of the blouse. If it's not to your taste, you could remove any original patch pocket and either reposition and reapply it or discard it altogether. 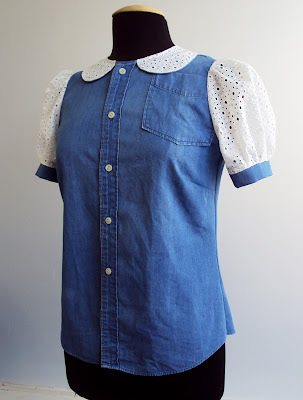 I drafted the Peter Pan collar for this creation myself because I didn't like the blouse sewing pattern's collar design. I wanted it to stop either side of the button stand. 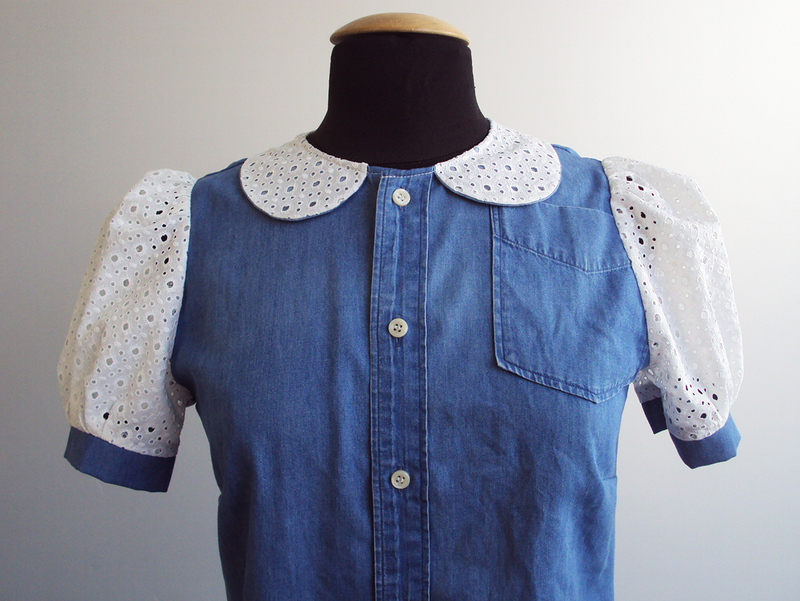 The top collar is embroidery anglaise and the under collar is cut from the chambray harvested from the sleeves of the original shirt. I really like how the anglaise has been left unlined on the puff sleeves though so you'd get a hint of flesh through the holes. The sleeves bands have been made from more of the harvested sleeve fabric. If you would like any more info about this creation, please leave a comment. I'll try to leave a legible response! 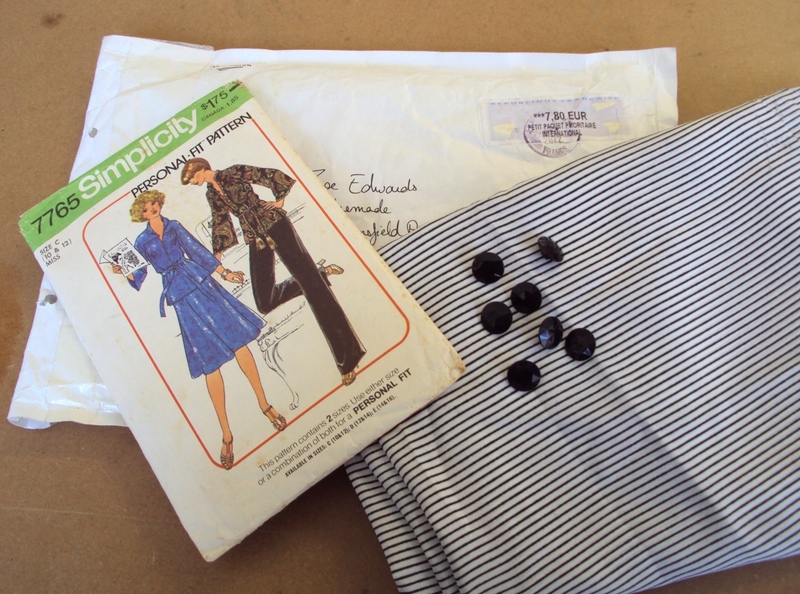 The package contained some black and white striped drapey synthetic crepe, some facetted black buttons and a 1970s Simplicity tunic sewing pattern. I decided not to go with the pattern Cecile included in the package. 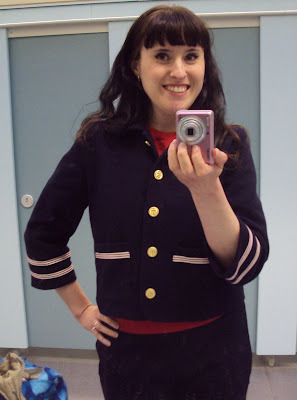 I really liked the style but it didn't look like it would a cardigan would fit over those loose sleeves very well. 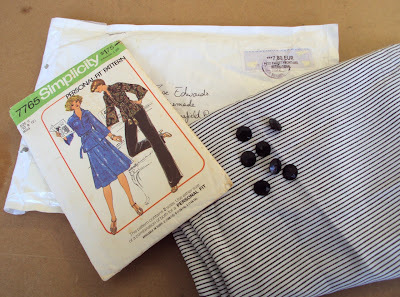 I hadn't yet found the right fabric to try out Simplicity 2601 (pictured below), but when I saw the black and white stripey stuff Cecile sent, I thought now might be a good opportunity. I think this pattern has a timeless look to it, it seems simultaneously retro and contemporary, which seems very much in-keeping with the Parisienne vibe. 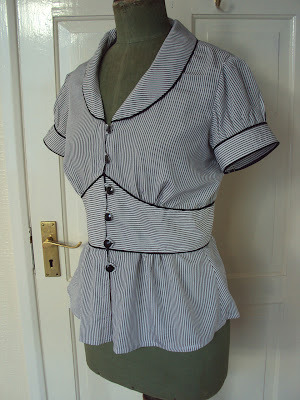 I chose the collared neckline and the short puff sleeves but omitted the sleeve band ties. Did it look like the photo/drawing on the pattern envelope once you were done sewing it? Is it arrogant to say that I think mine looks better?! Better than the version in the envelope photograph anyhow. I was warned that this pattern sits very high up on the waist, but considering I have a high natural waist it sat well on me. Yep. Although I went a bit off-piste in a hurry to move this project forward and had to go back and re-do a couple of steps. I feel it's quite a deceptively simple pattern. I guess it's the midriff band, which is self-faced, and the button placket fastening that makes the pieces add up and makes the cutting out stage may never end! I like how well is works with the application of piping, although this added A LOT of time required to get this project done, which has left Cecile twiddling her thumbs for me to wrap up Round 2 of our project. I dislike how the button placket finishes quite high leaving an opening right where I feel most conscious: my belly! 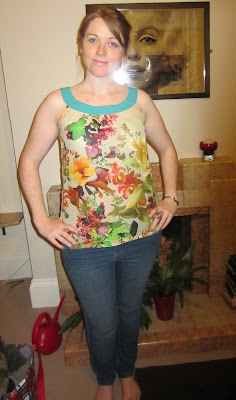 I usually wear a vest under tops anyhow because I'm always chilly, but a vest underneath this blouse will be compulsory. The thin stripey crepey stuff previous described. It has a lovely drape which I thought would work week for the gathered bust are of the upper bodice and the skirt section. However, something less fine and floppy would have been nicer to work with for the sections that require interfacing or doubling up, and the thinness also posed quite a challenge when applying the piping. I took my time though, discovered new reserves of patience and made it work the best I could. 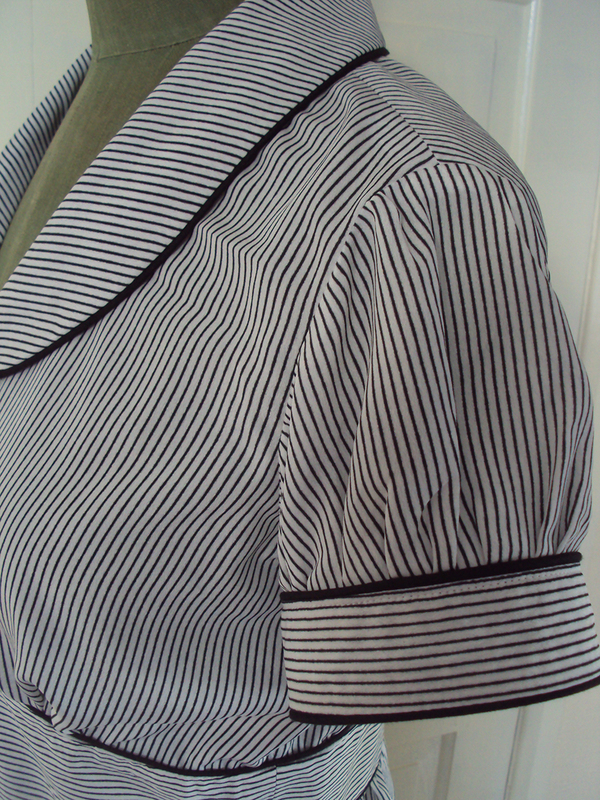 I was pleased that this panelled pattern allowed me to play with the direction of the stripes. 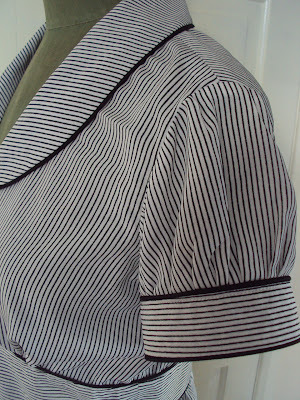 The result is more evident when you see the blouse in the flesh as the fine stripes in the photos do that strange TV thing. 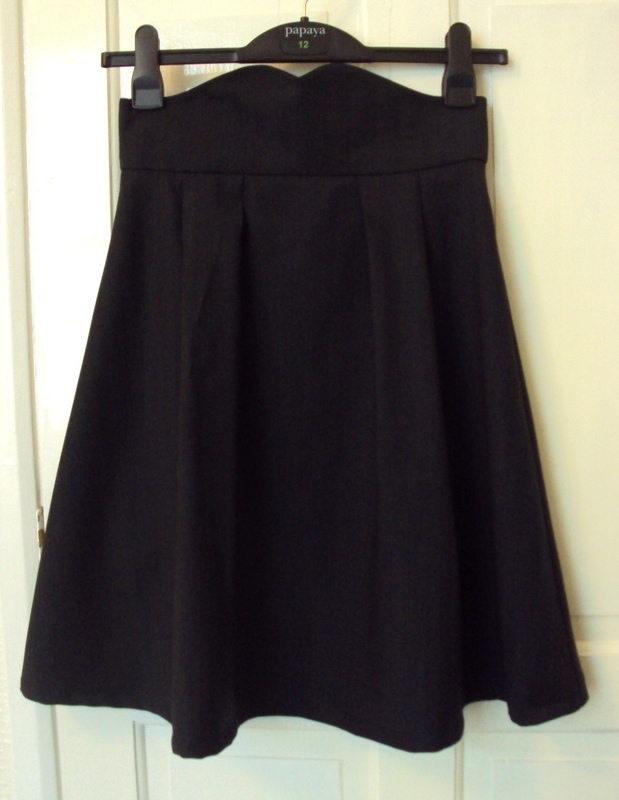 Normally, the standard changes I make to sewing patterns are raising the waist line and adding more width at the hips. Neither of those were necessary in this pattern so the only pattern change I made was to redraft the sleeve band. The design changes were the addition of piping and altering of grain lines to create different directions for the stripes. 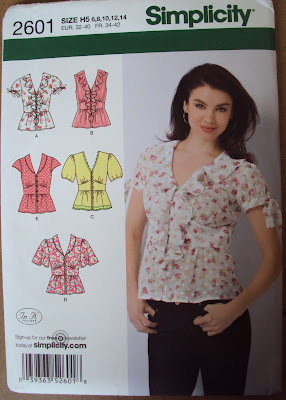 Umm, yep I would make this again but in quite a few years time as I have a stack of other blouse patterns still to try. It might be cool to try it with a contrast fabric for the collar, sleeve bands and midriff section, perhaps a floral with a solid for the rest of it. I'd like to see that. Yes I would recommend it to others, but I would alert them to its high-waistedness and belly-gap! 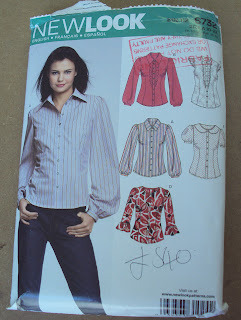 I'm not sure quite how close this final blouse remains to the initial vision of 'Parisienne' Cecile held. However, taking the inspirational starting word or phrase and then the materials each other has provided, and then running with them in whatever direction feels right is a big part of the actualisation of this project. So whatever the look and form of the final garment, as long as it exists then it has been a successful round. 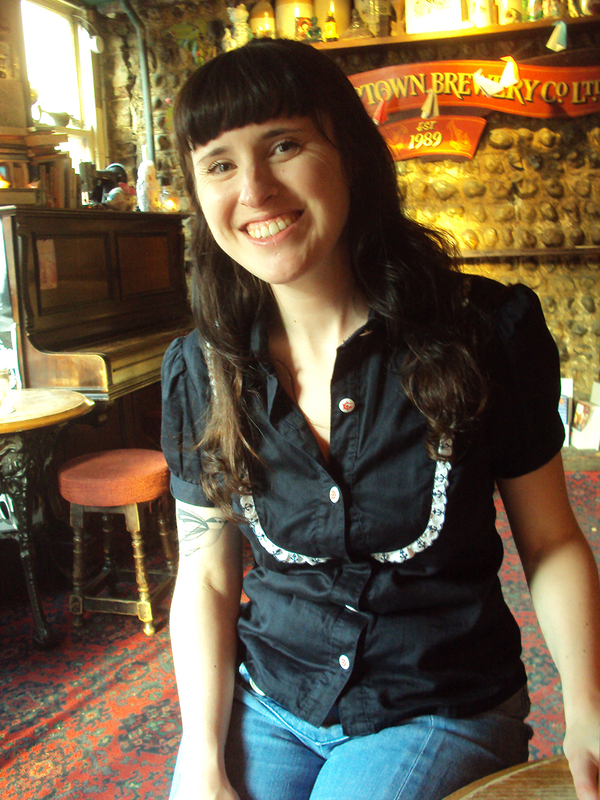 Plus I have already worn this blouse twice in real life and it was very comfortable and lovely to wear. So if that isn't the definition of a successful creation, then I don't know what is! A massive thanks to Cecile for creating these darling little Hem-isphere Project labels to put in our creations from this project! They make the garment super-special! I'm very excited to announce the creation of a new flickr group called Me-Made-Living. Towards the end of the recent Me-Made-May '12 challenge, some of the members of the MMM'12 flickr group mentioned that they would be sad to loose the interaction and support that had developed during May in the group. If the peops are making requests, I'm listening! So here's a new group where people who create their own clothing and/or accessories can hang in-between me-made/self-stitched challenges. Like the Me-Made and Self-Stitched flickr groups, this new group is a place to share the documentation of outfits/garments that you've worn that consist of or include self-made stuff. Like the other groups, this is for things that actually get worn in real life, and NOT a place to simply show off your latest creation. This group is a place to see how other members are rocking their self-made things, to get inspiration and discuss relevant topics. Unlike the Me-made ad Self-Stitched flickr groups that have gone before, no 'signing up' to any pledge is required. You can join the group with more ease, no-one needs to accept your membership. It's totally up to you how often or infrequently you participate and share your photos. If you have been/are interested in getting involved in the me-made/self-stitched challenges but have yet to feel you have enough self-made or refashion things to commit to a whole month, this group could be just the ticket to start sharing the outfits you put together which include a handmade item and get involved in the me-made community. Remember: Me-Made's are for LIFE, NOT just for MMMay or SSSeptember!!!!! Personally, I plan to share one photo a week on the new group and also on this blog. I want to continue to work out new wearable combos of my self-created garments and I'll share my favourite/most-success of the week, each week. This wholly me-made outfit may not look like I've embarked away from previous combinations, but i assure you it's a new one. I've never worn this short-sleeved sweatshirt without a long-sleeved T-shirt underneath and I was worried I'd get cold. But it was actually fine and very comfy. This jacket has really started to be something I rely on. It fills a certain role when the weather is fairly warm but changeable. It's quite light so if I take it out and it's not needed, it fits in my bag without being too hefty. Hope to see you over at the new Me-Made-Living flickr group! This is a momentous day. 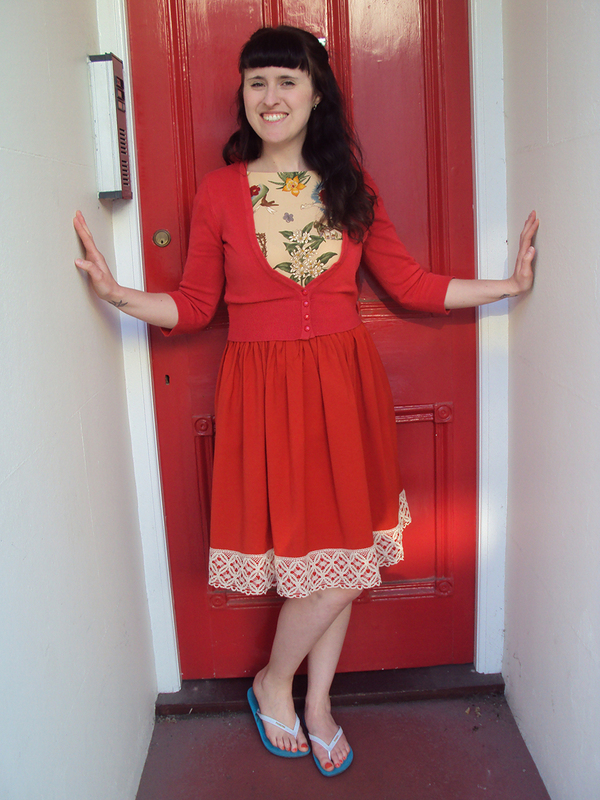 It is the beginning of a new weekly feature on this little blog of mine: Refashion Friday!!! Each and every Friday I will endeavour to share an idea/inspiration point/tip/trick/tutorial to arm refashionistas with ammunition to turn unwanted garments into wonderful and wearable creations. 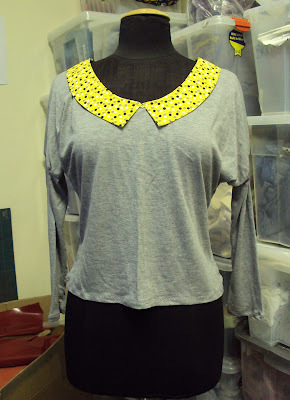 For today's inaugural Refashion Friday post, here's an idea for how to rev up a boring old plain T-shirt. By adding the contrast shawl collar, you've still got the comfort and ease of wear you get with a T-shirt, but the whole garment is more dressy and cute. 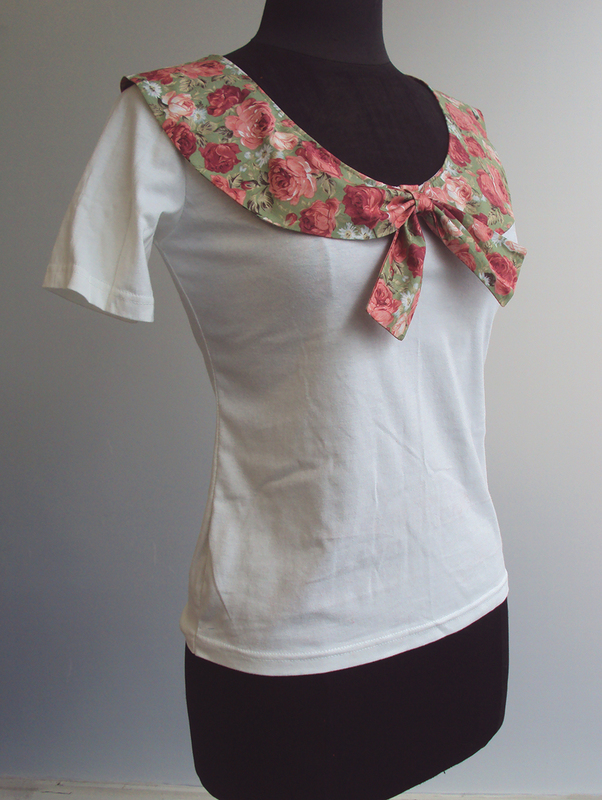 There's one of two ways you could create a garment like this from an existing T-shirt. You could either take a T-shirt that already fits you (or the indented recipient) well then recut the neckline, make the new collar and then attach the collar to the T-shirt. 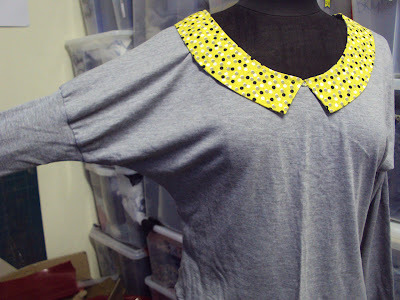 Or you could do what I did here: take a large loose fit T-shirt originally intended for a guy, and cut it up and remake it using a T-shirt sewing pattern to fit you before getting involved in the collar section. I took the collar pattern from New Look 6808 (pictured above) to make the collar. I also used that sewing pattern's front and back pieces as a guide to recut the new T-shirt neckline. 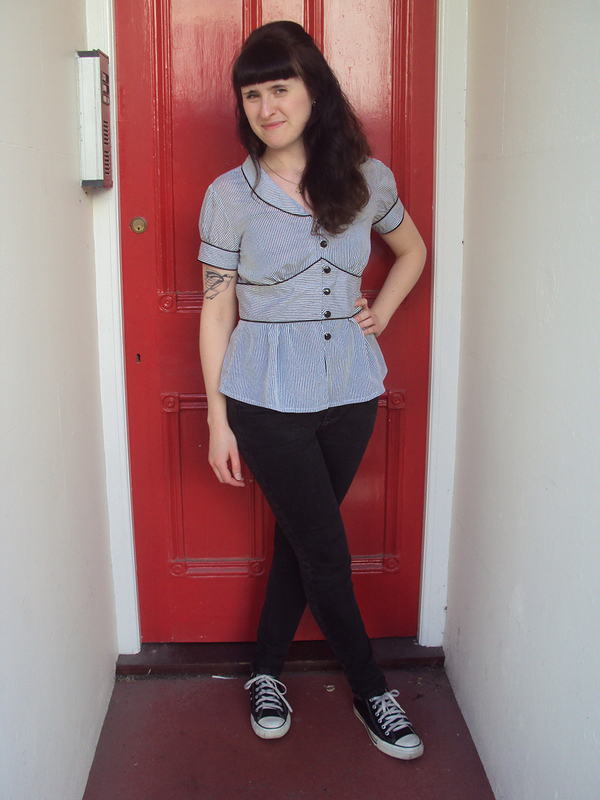 Although the sewing pattern is intended for woven and fabric and the T-shirt is of course jersey, it works fine as long as you're careful not to stretch the raw neckline before you get round to attaching the new woven collar. I hope some of you lovely readers found this idea useful or inspiring. If you have any questions, please leave a comment and I'll be happy to elaborate in the comments sections. Happy refashioning! This is a cleaning-house type post in which I share with you a couple of creations I made ages ago but all the MMMay'12 documentation kind of got in the way of. 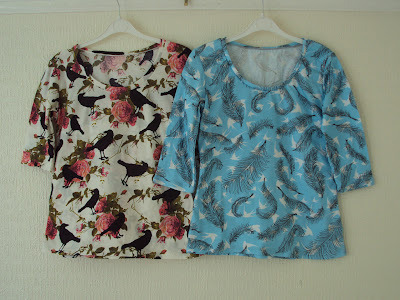 These are two jersey tops I made to sleep in during MMMay'12 and beyond. 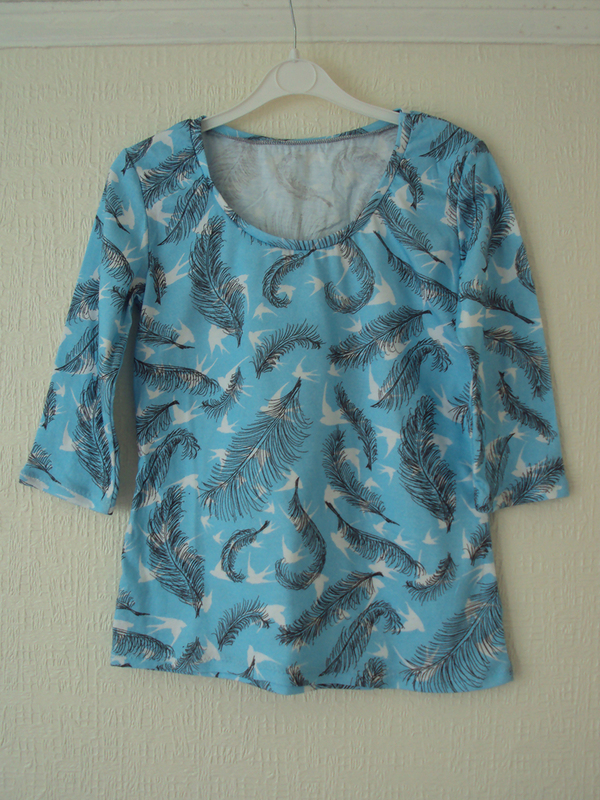 I already have a fair few items of self-made sleep wear, enough to scrape through a me-made/self-stitched month, but I thought some new ones (particularly ones with birds on them) would feel like a treat during the challenge! Please don't ever make me decide which print design I like more: birds or anchors. I think it's currently 50/50, but on any given day that ratio can fluctuate. 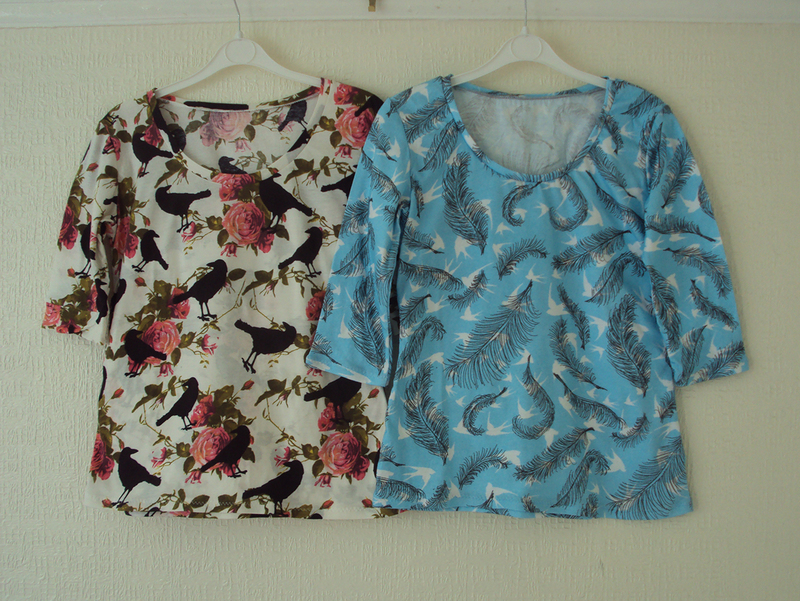 Needless to say both these bird prints are so far up my street I sometimes receive their Amazon deliveries by accident. I got both the crow and rose fabric and the swallow and feather fabric from work, they were in a delivery which included sample fabric donated by a jersey manufacturer. These sample lengths were probably created to test the print and aren't actually of garment making quality (which is why I could snaffle them because we wouldn't be able to use them at work). The fabric is very soft so nice to sleep in, but the jersey has no stretch recovery: if you yank it, it remains warped and doesn't ping back like you'd expect jersey/knit fabric to. I know that repeatedly laundering these tops will see them become increasingly strangely shaped! But I figured I'd get a few months, maybe a year, of use from them before they become too ridiculous to wear anymore, even during the night time. 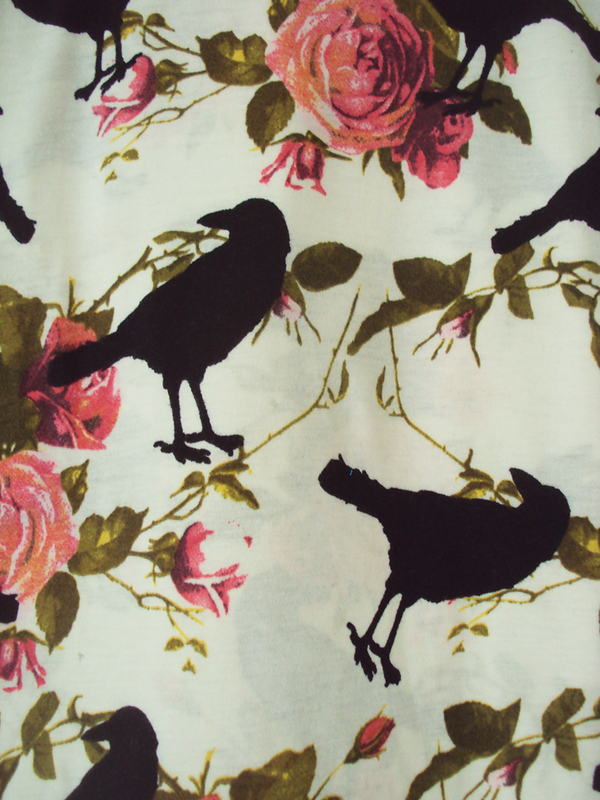 And for that decent hit of bird print action, the hour or so it took to make them will have been time well spent. Yesterday I went to the Brighton Bloggers' Bash, a meet-up arranged for local bloggers to get together at Super+Super HQ, make contacts and discuss their blogging hobby/job. I met some nice people including a lovely lady who doesn't currently have a blog, but is a prolific sewer and would love to start a sewing blog (having had a couple of false blogging starts in the past). However, she feels something was creating a barrier, and she with so many sewing bloggers out there she might struggle to find a unique voice and she is also in awe of many of the writers of the most popular blogs. One of the most common reasons people give preventing them from doing something creative is that it has already been done. Lots of people are interested in doing something such as making garments, starting a new blog or any kind of creative activity. Many people feel daunted by the plethora of existing blogs and huge range of existing makers in any given field. It is as if there should only be a certain number of people in any creative field, as if it were a party in a small house and could get too crowded. I believe this is a manifestation of a fundamental misunderstanding of what creative activity is. This misunderstanding is deeply rooted in our culture. We learn it at school and through the media. We are taught that creativity is the expression of a higher ideal in a finished object of great beauty and skilled execution. This is wrong in approximately fifteen different ways. It is complex but basically it comes down to perception of value. In our society value resides in finished products. Art is one category of the production of products. Craft is another. We look with lust and desire at finished products and believe they are created by specialists using talents beyond our mortal capacity to understand. We are thereby separated from our own creative power which is what makes us depend on shopping to satisfy all our psycho-spiritual needs. From outside the house party of creative practice looking in we see only finished products. We mistake the product for the practice. We are excited by what is happening but like Peter Pan we find we cannot fly in through the window ultimately because of our own self limiting beliefs. It’s important to understand that EVERYBODY feels this. Even those who appear to be such ‘natural’ creators, those that have identified themselves as ‘creatives’ early in life have had some crucial intervention, some teacher or parent who told them they had talent (thanks Mrs Cheeseman) so in a way they are beholden to the same false idea as all the rest anyway. Of course praise is not enough. It will get you through the door but you won’t stay if you don’t find the secret, and the secret is process. The only difference between the maker and the aspiring maker is that the maker realises that the process is everything, the final product is merely an effect of the process. Process is everything. Originality is a fetish that only makes sense in terms of intellectual property law. Forget about originality. Even if you took an idea verbatim from somebody else, your process of making it would be unique, the journey you took would be of value to you and by extension to those around you. This is especially evident in craft where similar patterns produce uniqueness and process is celebrated, where bloggers share the process of creating and pontificate on how it changes them and their lives. This is what ‘Art’ wishes it was. The value is in the process and the finished product is a continuation of that process, affecting the lives of others, that scarf you made for your dad lives on in the process of his life. Value itself is a living process not to be confined to a number or a thing. We are conditioned to understand the final product as the container of quality. In order to believe this we have to believe that each category of products is produced by specialisms we cannot comprehend. This is where ‘talent’ comes in. Reinforced by the talent shows that now dominate our TV screens the biggest of all lies is talent. The very idea that some tiny percentage of people ‘own’ creativity by some genetic twist of fate is laughable. There are no ‘creative people’. Creativity is our species defining characteristic. We all need to use it, it is a psychological prerequisite for a happy life. Anything can be learned by anyone. So don’t stand outside the party waiting for an invitation. Don’t be confused by the dazzling heights that other bloggers and makers have achieved, look at the processes they are engaged with. Each process is unique, each one fills a vital gap in that person’s life, without this deeper engagement they would not be able to continue the work for years and years. Success, slick production values, money, attention, these are all byproducts of a process of self discovery that will last a lifetime. And they may never come. If the process is right for you it won’t even matter anymore. Any stage of that process is as essential as any other. That includes the first six months however awkward and frustrating they may be. More than anything else consider this: we are in a big phase of change, we are renegotiating our cultural values and we need everybody to join in the debate. This includes you. We need your unique process, we need your unique contribution. Making stuff is cultural production. Nothing is trivial. Now does the house party still look full to you? Ring the bell then go through the door. Always fashionably late, it's time for the March 2012 instalment of the Poetry & Clothing project. 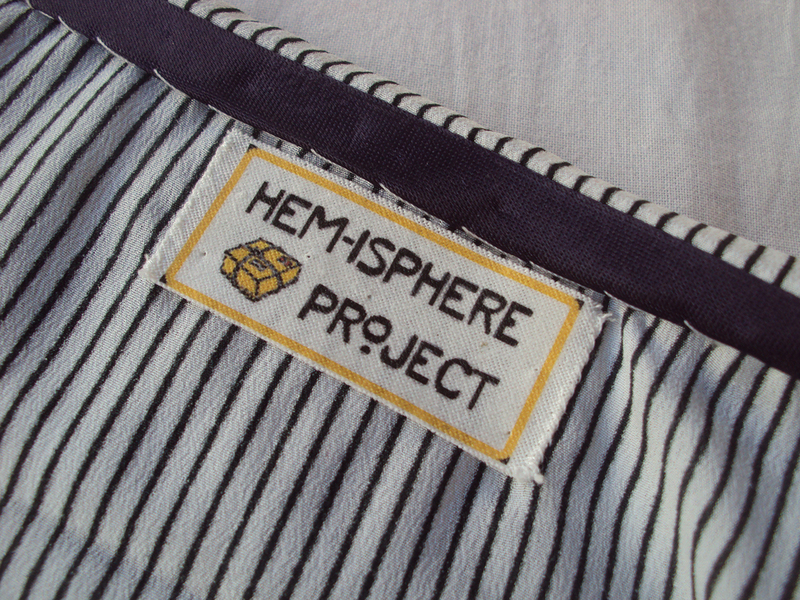 March 2012 was Month 11 in the project that sees a Zo-made garment made for and sent to my friend Harriet, who in turn riffs a poem based on what she receives. For those who follow the P&C project (who wouldn't?! ), you may remember that February's package was a hefty one including a stripey knit top, cosy mittens AND an underwear set because February is Harriet's birth-month. Plus she always feels a bit down at that time of the year so I wanted to cheer her up with new garments. For March's creation, I needed to take things down again a notch, so created just one piece. I know that Harriet loves to wear the batwing dress from the September instalment, plus she wants to get some grey pieces into her wardrobe, so I decided to make a garment from the same pattern as my leopard collar batwing top which would incorporate both of those elements as well as a fresh pop of colour to welcome the Spring. The grey jersey came from a big bag of sample fabric we received from work, and I picked up the contrast yellow print cotton at the first Brighton sewing meet-up and fabric swap back in June 2011. I love how the grey elements of the quilting cotton match the grey marl of the jersey. LOVE this poem! It encapsulates both the joy and depression that the month of February routinely brings into Harriet's life for the duration. 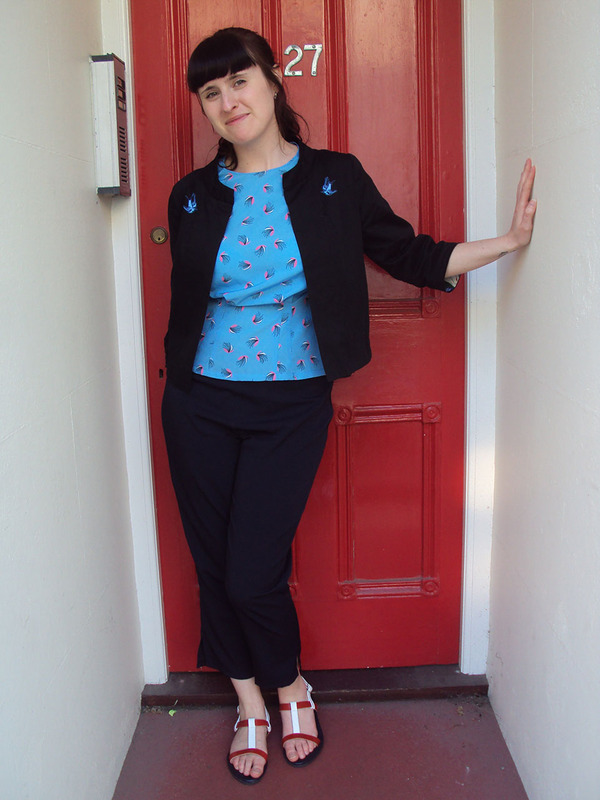 Navy Cropped Trousers: Best Trousers Ever? Of course they are not the best trousers ever, but I am loving them pretty hard at the moment. 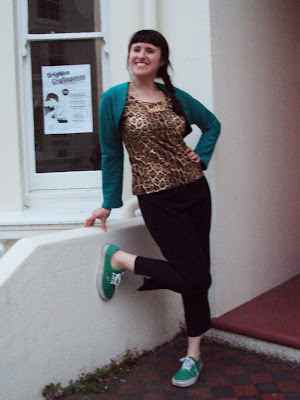 These cropped trousers have already received a fair bit of blog exposure during my documentation of the recent Me-Made-May '12 challenge, but now it the time to talk about this creation more thoroughly. 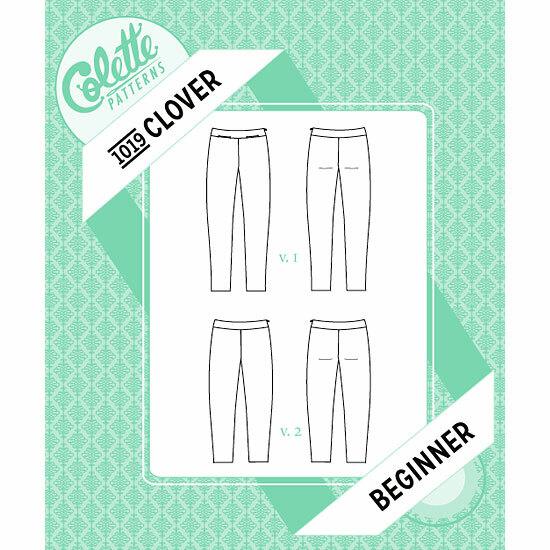 I started out with the Colette Patterns Clover pattern that I bought at Sew Over It last year. I then made a bunch of changes that I'll explain about below. As with every time I use a Colette Patterns sewing pattern, I erred on the side of caution, made the size 8 as per my measurements, and they came out WAY too big. One day I will learn and make the size smaller than my suggested. I ignored the instructions and followed my own method of construction. I used to make a garment style similar to this at work so I felt comfortable going off-piste. I wanted to make them easy to re-fit if that turned out to be needed (which it massively did) so I chose an order of construction that would make refitting super-simple. I've been looking for a decent capri-pants style pattern for an age. Such styles are notoriously difficult to fit to your exact shape, so I was prepared for a pile of adjustments, I just hoped this pattern would provide a decent starting point which I feel it did. This pattern requires a woven fabric that has a decent elastane/Lycra content. 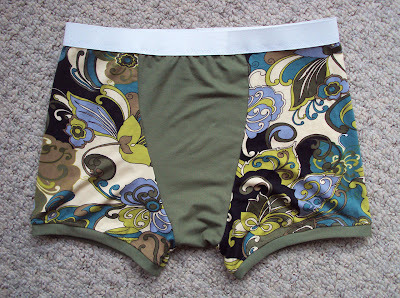 Seeing as I only use fabric that is secondhand or already in my stash, that left my options pretty slim. I have two pieces of fabric in my stash that match that description that I really love, but I didn't want to risk wasting them on this creation in case it turned out badly. I'd had this nasty navy bengaline in my stash for about six years and nearly gave it away countless times. 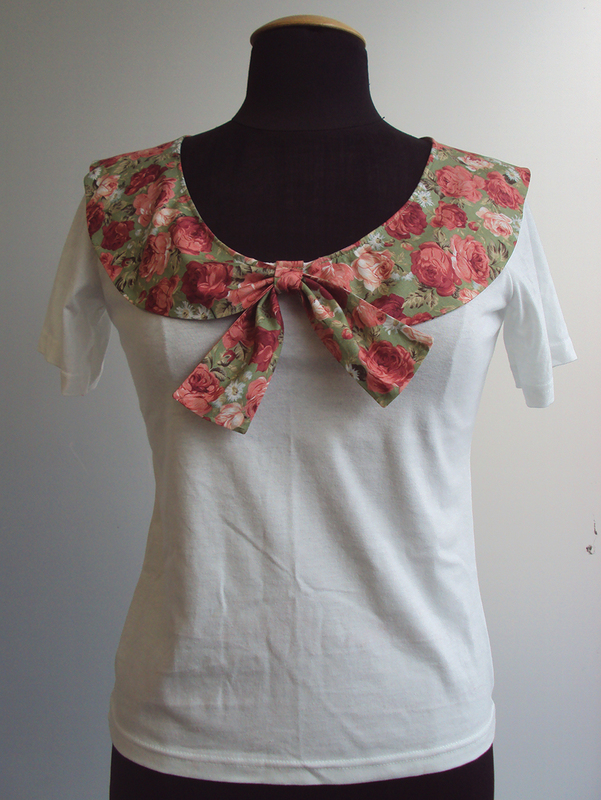 I'm glad I didn't because it proved the perfect fabric for this (hopefully) wearable toile. It feels pretty nasty though and can be a bit sweaty if I've been running or rushing about as it is more synthetic than reality TV. Ah, here's the biggie. Well, I started out tracing my chosen size onto pattern cutting paper and making some alterations based on my prior knowledge of my body and how I like to wear my trousers. I added about 2cms to the back rise to accommodate my bootie, plus 1cm to the front rise for comfort. I reshaped the side seam around the waist because the original pattern seems to go in pretty violently at that point and I knew the final garment would cut in and feel uncomfortable if I left it like the original pattern. I've finally accepted my belly isn't going anywhere, and seeing as it's here to stay, we may as well make friends so I may as well accommodate it. Altering the waist as much as I did meant redrafting the waistband pieces too. I think I shaved a bit off the hips as well as that shape seemed pretty exaggerated. After I had half-made them, I tried them on and realised some hefty refitting and shortening was going to have to take place to make them wearable. The result was looser than I think the pattern intends, but I like the more casual look for daytime outfits. I definitely plan to make these again, but I think I'll scrap the altered pattern and start again from scratch with the size smaller. I'll then go through same initial changes I made and be prepared for a bit more fitting if needs be. I predict that starting with a size smaller will bring make the proportions less casual. I'll also make the next pair a bit shorter, more capri pants than cropped trousers. Yes I would recommend it to others, as long as they were prepared to do some tweaking to get a good fit. Although not perfect, not quite the silhouette I intended when I started this project and made from nasty fabric, the fact that these trousers have seen serious wear since their completion shows that they are a WIN! MMMay'12: Days 29, 30 & 31 THE END!!! Well, the me-made/self-stitched challenge this year was totally amazing. More people signed up and participated than any of the previous challenges, and the flickr group and Facebook page were on fire!!! I've been so inspired by the amazing variety that comprises the online handmade community. It really is a world of wonderful individuals that have chose to be linked by the common challenge of wearing their self-made items and getting out and about. I've always said that creating and wearing your own garments means that more of your personality is on show than when you are wearing mass-manufactured, shop-bought clothing. You have to make all the decisions yourself, from what pattern to use, what fitting alterations you might make, what fabric to make it in, which buttons to use and so on. When you by something ready made, someone else made all those decisions for you, and often with price points in mind rather than aesthetics. And even if aesthetics are the priority behind those manufactured garment detail decisions, it's not necessarily your aesthetic that is being considered. Unlike when you make something your own. 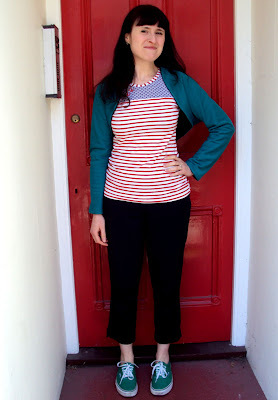 So let's have a look at the final outfits I rustled up from my own handmade wardrobe for the Me-Made-May '12 challenge. I dragged these shorts out of the depths of my deepest drawer and was amazed that they still fit (more or less!). I used to wear these soooo much when I lived in sunny, and occasionally sweaty, Spain and it is somewhat shocking that the UK has managed to be consistently warm enough for me to wear them without fear that the weather would change half way through the day leaving me freezing. 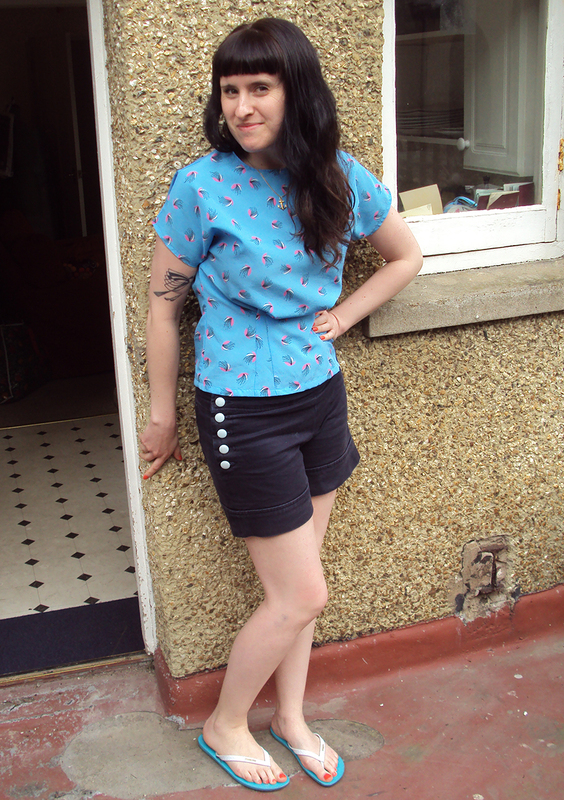 I think this shorts and blouse combo could look quite 1930's if I wore more era-appropriate footwear and hairstyle. How much red can you cram into one photo? Lots!!! This dress makes me smile whenever I see it. The final day of the challenge!!!! This is possibly the worst photo in terms of clarity, but maybe my favourite outfit of the whole month. It was comfy but you can also see some of my figure. It is vibrant and reflective of my personal style as it stands today, but I can also wear it during the day without getting stared at!!! I wonder if I would have come up with this outfit if I hadn't been 'forced' to create new garment combinations because of my challenge pledge. Thanks so much to everyone who participated in this challenge, your energy and creativity reminded me exactly why I love the online creative community and how truly fabulous it is to be part of it. Also thanks so much to everyone who commented on my challenge posts throughout the month. I really appreciate each and everyone of them and it was so often with the readers of my blog in mind that I tried to create different, and hopefully interesting and inspiring, outfits throughout the month. There are lots more things I want to talk about regarding challenges, community and groups, but I'll expand on those another day. This is an epic final instalment to the 'Other People' section of the recently completed MMMay'12 challenge. Vic took her mum on holiday to Bath, had a lovely time, wore her new Zo-made Peter Pan collar shell top and found a traid donation bank! Good work on all fronts, Vic. My mum wore a beige wool skirt that I made her soooooo long ago. I had totally forgotten about until she emailed me this picture. I made it before I understood about linings and she had to line it herself! Sorry Mum! Apparently the weather was way too warm for this outfit, but I'm so glad she wore it because I may never have been reminded of that beige skirt. One of my hopes for this part of the MMMay'12 challenge is that my peops who I make garms for become more comfortable in them than they may have felt before. 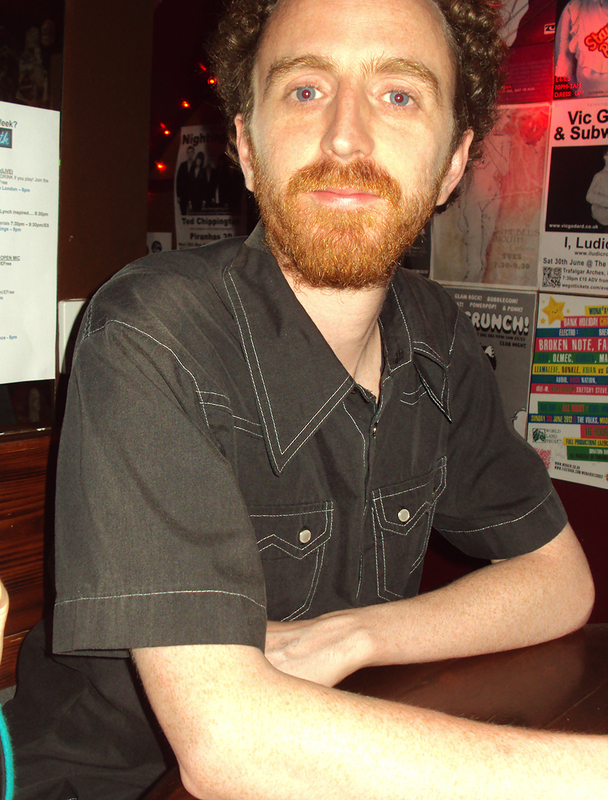 Pat has been wearing his Book Launch shirt quite a bit this month. I love it when he does because it really makes his blue eyes look ultra blue. I hope he feels more comfortable in it now he's been made to wear it so often! On Day 25, Harriet wore the curved waistband skirt that I made her for the October instalment of our Poetry & Clothing project. Apparently she wore it with a yellow and white checked blouse and looked quite the school marm! Saturday was quite a busy day for Vic, not least in terms of wearing Zo-made clothing! 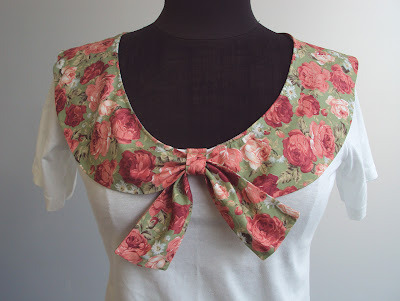 She started the day wearing the floral chiffon top. 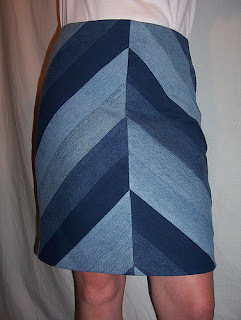 Then when she came home she changed into her 'Ok' denim skirt and a vest because it was super hot. And finally she went to bed in Zo-made turquoise and red Summer jam jams. Phew, what a day! Not much to say other than Patty wore these pants! But of course you'll have to take our word for that. This pic is so hilarious! 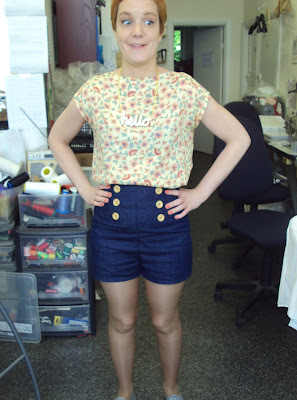 Kirstin wore some denim high waisted shorts I made for her a couple of months ago. She also wore a blouse made by her talented friend Amy and a wooden 'hello' necklace by Rock Cakes. Don't forget you can win your very own 'hello' necklace AND a pinup Betty badge made by this very lady in my giveaway here. Vic is pulling out all the stops for her final days contribution to MMMay'12. 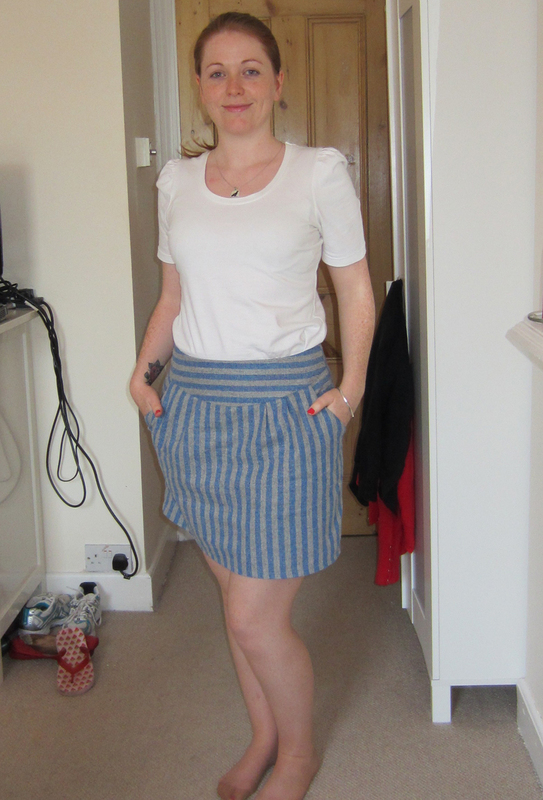 She wore a stripey wool skirt and gathered sleeve head T-shirt and looked generally lovely. She was such an awesome contributor to this part of my challenge, always handing her 'home-work' in on time and giving me text updates about what she was wearing. She wears skirts well, does my mum! On Day 30 she wore a front flap skirt that she commissioned me to make. 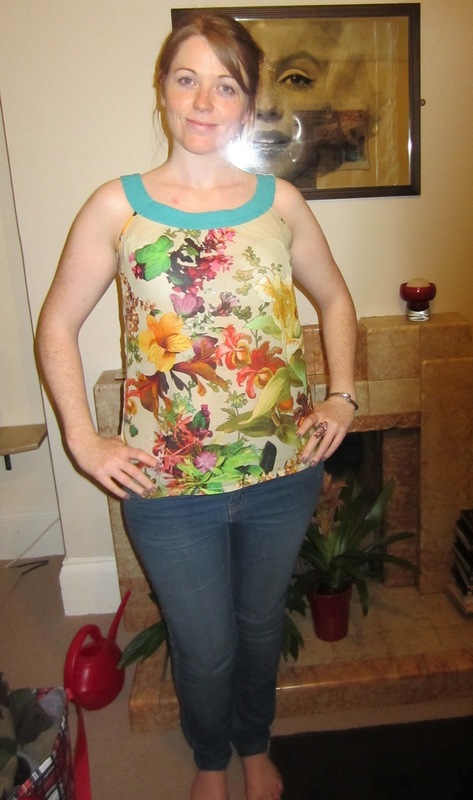 The pattern is from a Burda magazine and she bought the fabric herself for me to use. Mumma has been awesome this month, diligently photographing and emailing me her photos in a most punctual manner! The final day of MMMay'12. Pat wore both his Brokeback Balcony shirt and what are fast becoming his favourite pants (I may have interpreted that last bit). I really want to thank my beloveds for taking part in MMMay'12 this year. It has made it utterly special and I feel so elated and proud at the sight of them in the garments I've made. So thank you Kirstin, Vic, Mum, Harriet and Patty. You are all absolutely wonderful (and amazing models! ).